Negotiator: "Great personality and very smart," Trump said of Kim. "Good combination. He’s a worthy negotiator. He’s negotiating on behalf of his people, a very worthy, very smart negotiator, absolutely." See the Financial Times. Talented: "I learned that he’s a very talented man," said Trump. "I also learned that he loves his country very much." See Time. Meanwhile in North Korea, Kim is talking about how it hurts to sit from how hard Two Face Trump was kissing his a$$. 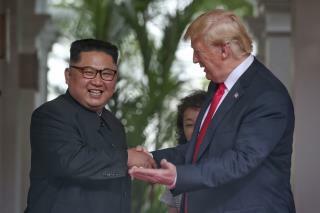 Those of you who have esteemed and pledged support for Trump must now be very proud to know that your President idolizes Kim Jong Un as HONORABLE, TRUSTWORTHY, TALENTED, A GREAT LEADER, GREAT PERSONALTY, VERY SMART, GREAT NEGOTIATOR, and a LOVING PERSON, while the rest of the world sees him as a maniacal and murdering DICTATOR.